Reports that Yahoo Inc. built custom software to scan all of its users’ incoming emails on behalf of U.S. intelligence agencies didn’t sit well with Americans, according to a new Morning Consult poll. Half of those surveyed about Yahoo’s surveillance program said they viewed it negatively because it violates the privacy of Yahoo Mail users. But 25 percent said the program was a good thing because intelligence officials would be able to view emails related to potential terrorist or crime plots. 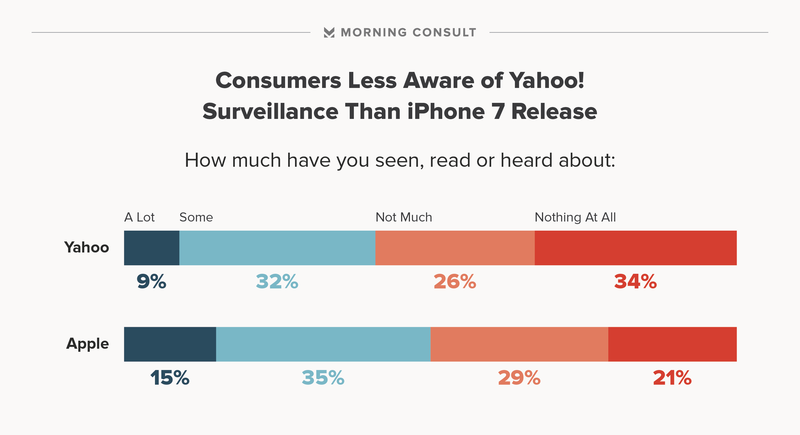 But 25 percent of respondents also said they didn’t know or had no opinion about the revelation of Yahoo’s email scanning program. Reuters and the New York Times reported that the Department of Justice requested the data from Yahoo, which was approved by the secretive Foreign Intelligence Surveillance Court. The order directed Yahoo to develop software to scan all incoming users’ emails. The system was designed to search for messages with a computer “signature” linked to the communications of a state-sponsored terrorist organization, according to the New York Times. The discomfort over Yahoo’s surveillance program unified respondents of varying party identifiers and ages. Half of Republican respondents said the program was bad because it violated users’ privacy, as did 48 percent of Democrats and 52 percent of independents. Only 28 percent of both Democrats and Republicans viewed the program positively because of the extra information it could give crime and terrorist fighting intelligence officials. A mere 20 percent of independents agreed with that sentiment. The Yahoo story shook tech professionals because of the implications for its privacy practices, but it didn’t have as much resonance with the public. Only 41 percent said they had heard some or a lot about it, and 60 percent said they had heard “not much” or “nothing at all” about the revelation. So far, the Yahoo story has failed to reach similar public heights as the Federal Bureau of Investigation’s standoff with Apple Inc. earlier this year. Apple’s fight against a government order requiring it to unlock an encrypted iPhone belonging to one of the San Bernardino shooters reached the mainstream, even garnering it a slot on John Oliver’s Last Week Tonight. While the FBI ended up dropping the Apple order and asking a third-party firm to unlock the phone instead, a February poll conducted by Morning Consult found national security trumped privacy and digital security in the American public. In that poll, just over half (51 percent) of registered voters said that Apple should have unlocked the phone, compared with 33 who said the company should have resisted the order. In another February poll, Morning Consult found that 41 percent of respondents at least somewhat supported the U.S. government requiring tech companies to provide access to users’ personal data so investigators could unlock cell phones and access personal information of suspected terrorists. But almost as many (39 percent) opposed that suggestion. The Intercept reported that Apple, Facebook Inc., Google Inc. and Twitter Inc. all said they had never received a government request similar to that of Yahoo’s and if they did, they would have fought it. Microsoft told the outlet that they had never scanned its users’ emails the way Yahoo reportedly did, but didn’t comment on the record about whether the company had ever received a similar government request. The poll was conducted from Oct. 5-6 among a national sample of 1,989 registered voters. Results from the full survey have a margin of error of plus or minus 2 percentage points. See toplines and crosstabs.